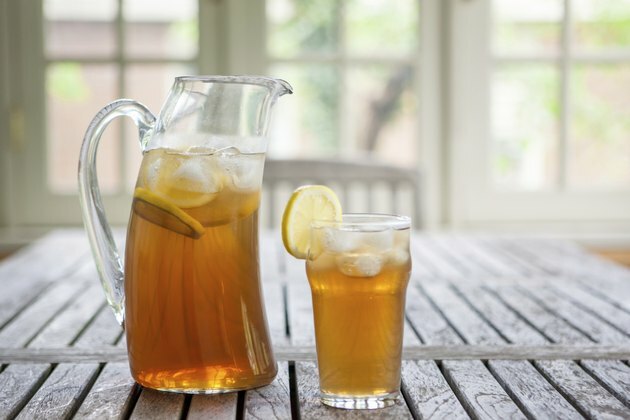 Can Iced Tea Replace Water for the Body? Although you need water to keep your body well-hydrated, some people don't like the taste of plain water. If you prefer sipping iced tea to drinking water, you do have options. Coffee, sports drinks, fruit juices, milk and iced tea can all contribute to your body's water needs. Unfortunately, many of these drinks also contain unhealthy added extras, like caffeine, sodium and sugar, which can sabotage your diet and jeopardize your overall health. Your body requires water to function correctly. Water flushes toxins out of your system, carries nutrients to your cells and helps your body maintain the right temperature. Although water makes up about 60 percent of your body weight, you lose it constantly throughout the day when you sweat, breathe and go to the bathroom. If you don't replace the lost water, your body can become dehydrated. Dehydration can pose serious life-threatening complications if left untreated. Although many doctors recommend drinking six to eight glasses of water or other liquids a day, this is more of a guideline than an exact requirement, according to the American Academy of Family Physicians. Your actual hydration needs will depend upon the climate where you live, your age and physical condition. People who live in especially hot climates or who exercise frequently often need more water than more-sedentary individuals who live in temperate places. Most healthy people can stay hydrated by following their bodies' cues and drinking to thirst. The urine of a well-hydrated person is usually clear or pale yellow--not dark or bright yellow. Caffeinated drinks can count toward your daily fluid requirements, but excessive amounts of caffeine can make you jittery. They can also cause you to urinate more frequently, which can lead to dehydration. Limit your caffeine consumption to a moderate amount, about 200 to 300 milligrams a day. After that, opt for herbal or decaffeinated iced tea. Unsweetened home-brewed iced tea contains no calories, but commercially available bottled iced teas often contain high levels of sodium, sugar, corn syrup, artificial sweeteners and other additives. Since these drinks frequently come in large containers, you might not fully realize how many extra calories they add to your diet. Instead of buying these drinks, keep a pitcher of unsweetened home-brewed tea in your refrigerator. As an added bonus, home brewed green or black tea contains more polyphenols than bottled teas, according to a report from FoxNews.com. Add flavor with lemon or mint sprigs.